Let me explain how to read / interpret / understand the ram information from the two pictures above. Up time shows how many hours did u switch on your computer. Free shows how many free ram left. Physical Memory at bottom is the key!!! The Physical Memory = 93% when the computer has 2gb ram only. 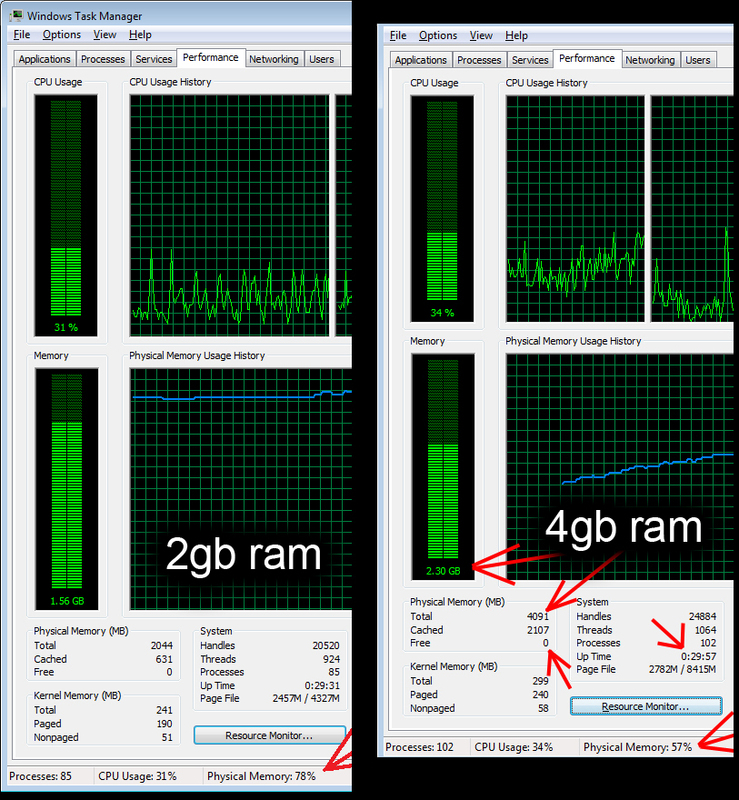 The Physical Memory = 77% when the computer has 4gb ram only. 100% - 77% = 23%. So I still have extra 23% physical memory after I switch on my computer for 10 hours. My computer doesn't lag anymore, doesn't hang anymore, doesn't slow anymore is because of this 23%!!! From the first picture (After 29 minutes I switched on computer), you might wondering why Free shows 0 value after I added extra 2gb ram? 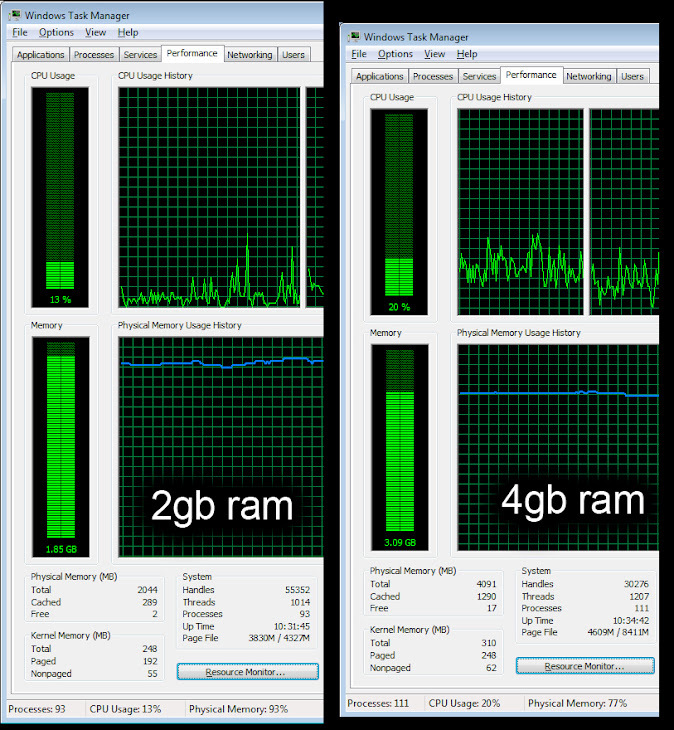 Supposedly I should have more free ram after added extra 2gb ram right? Why It is still 0 free ram? It is because I am using Windows Vista. Free will show 0 value on Windows Vista, but Free will show 1500mb value on Windows XP, it is because Windows Vista / 7 is using different memory management system if compare to Windows Me / XP. I am using Windows Vista, so the word "free" is NOT indicate the free of RAM, it indicates the free of CACHE actually. 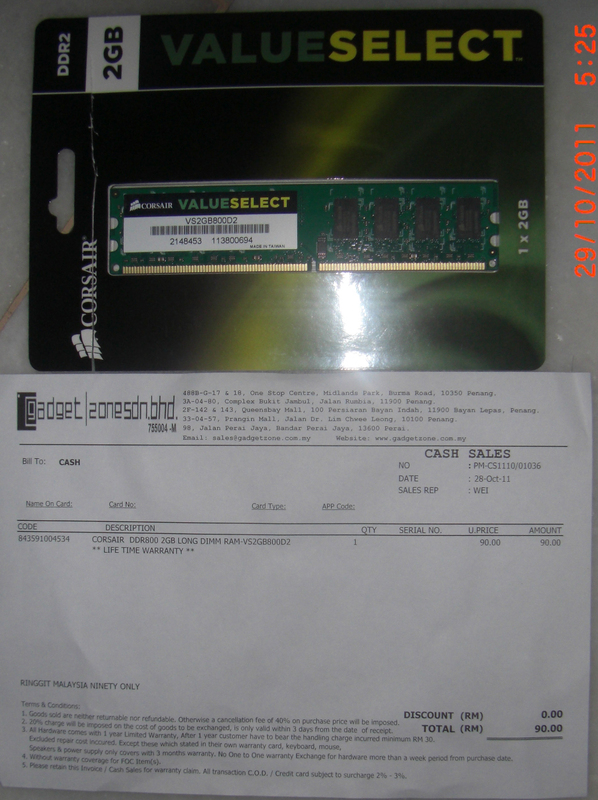 The processor inside CPU has 2 Cache components : level 1 cache, level 2 cache. Main memory (Ram) is 37x faster. If computer doesn't finish use the cache, if there are some free or remaining cache which is not used yet, it mean the cache is WASTED!!! We must fully use all the cache then only it is WORTH!!! Windows Vista / 7 is fully utilizing all caches effectively. When you open very few files on computer, there are very few data to store in cache, the computer will simply pick the useless data and put them into cache, because if lucky, u will use those useless data in cache in future. More info at here. When you open a bunch of programs, your PC has to store all the relevant data somewhere. It tries to store everything in memory (ie RAM) which is nice and fast. If you have too much stuff open (eg multiple tabs in Firefox), and/or if you don't have much RAM (eg 512Mb), then all the data won't fit in RAM. Windows makes a guess of what you're not using right now, and moves it from RAM to disk, into the Page File. Next time you access that program, Windows copies the data back out of the Page File and into RAM. If your Page File gets big: this means you have a lot of programs open using memory, and it doesn't all fit into RAM. If the PF is large then maybe a lot of the time Windows looks for data, it's in the PF rather than RAM. You'll get a lot of "page faults", and the computer will be slow. More info at here. Did adding ram really help to fix lagging, hanging, and slow problem? My answer is 100% absolutely YES!!! When my computer has 2gb ram, I need to wait 2 seconds everytime I open a folder. And after on my computer for 3 hours, I opened 60 tabs on Chrome, when I switch tab on Chrome also will delay 3 seconds, sometime even worse will not responding and hang there for 10 minutes!!! After adding extra 2gb ram, my computer has 4gb ram now. I need to wait 0.01 second everytime I open a folder. And after on my computer for 3 hours, or even 10 hours, I opened 60 tabs on Chrome, when I switch tab on Chrome, it won't delay anymore, won't not responding and won't hang too. I am so happy!!! Vегy gooԁ post. Ι'm experiencing some of these issues as well..